I love the colors of fall, so By the Stream, provided an opportunity to explore these colors. Being a large painting it took a while to complete. I found that I kept examining the leaves near my home every time I left the house. As I drove around the area I enjoyed the little flecks of color that stood out in from on darker trees. Each time I resumed work on this painting I brought that new knowledge with me. By the Stream started as a poured painting. This was the quickest approach to get some base color over the entire surface of the painting. You can see there was some masking fluid on the paper to preserve some white areas. After the paint dried over night, more masking fluid was added to save the sky, some of the light colors in the trees, and reflective spots in the water. The next day I sprayed the paper with water then applied paint using a very large brush. Because the surface of the paper was quite wet, I tilted the paper to let the color intermingle, much like using a pouring technique. This started to define the water and structure of the landscape. The image at left shows the result after one more painting session and removal of the masking fluid. As you can see, there is a lot of work to do to integrate the light areas where the mask was and make a cohesive painting. In the image at right I've worked on some trees on the left and reflections in the stream. Here I was able to test out an approach for finishing the painting. While looking at this photo I realized I needed more light blue reflections on the right side of the stream to clarify the transition from the stream to the bank. The detail at left shows distant trees added to the light sky areas. I've hinted at bushes at the base of the trees and used greens as well as browns to indicate the depth of the woods. I am happy with these results, so I continued with the rest of the painting using the techniques used here. There is a great deal of push and pull between light and dark areas and between warm and cool colors creating a rhythm to the painting. I'd love to hear your thoughts on the painting. Also feel free to ask for more specifics about my process. Every now and then people ask me about my studio. As you can see, the studio is in my home, in the basement actually. I moved it there after my son moved, since he had been using this space as his apartment for several year. 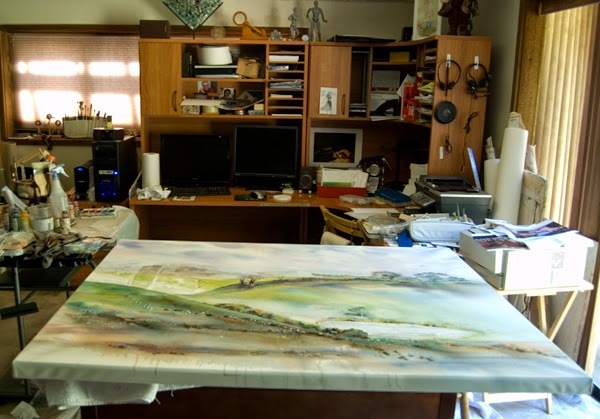 What you can't see lurking on the other side of the painting is my studio mascot, Dusty. She spends a lot of time down here with me. Watch my video where I introduce her. She may be lazy, but she is faithful. How should fluid acrylic paintings be protected? Some of my customers, gallery owners, and fellow artists have asked about my gallery wrapped acrylic paintings and how I protect them. Often people think acrylic paintings don't need to be varnished since acrylic paint is in essence a very thin layer of plastic when dry. Since I do my acrylic paintings on watercolor paper, I started to varnish my artwork to protect the paper from humidity in the environment. However as I researched varnishes to ensure I was using the right materials I learned that any acrylic painting should be varnished for a couple reasons. If you have read my blog post "Some basics things to know about watercolor" you know already about how important it is that the artist use high quality materials that are light fast. In other words pigments that won't lose their color quickly. Even though I use the best materials I can find to create the painting, I also make sure that either the glazing I use has UV protection or, in the case of gallery wrapped art, the varnish has UV protection. This practice increases the life expectancy of paint even longer. 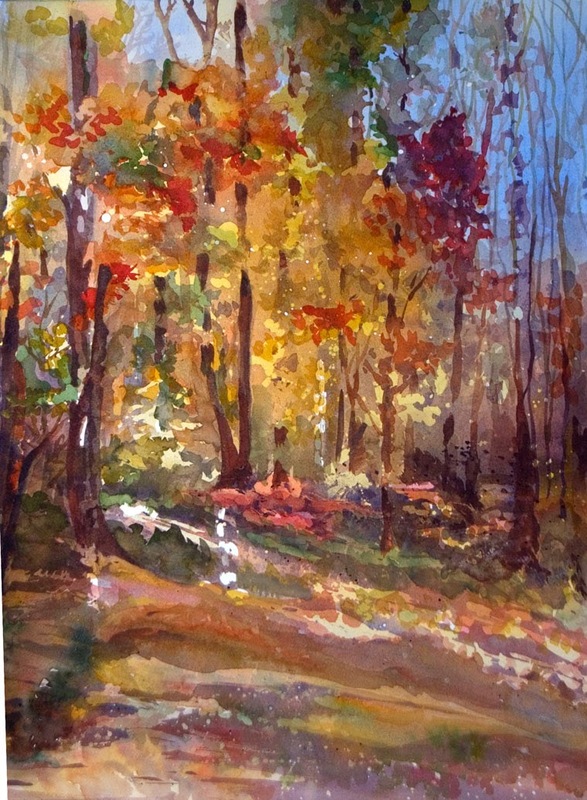 The need for UV protection is not unique for watercolor and acrylic paintings. 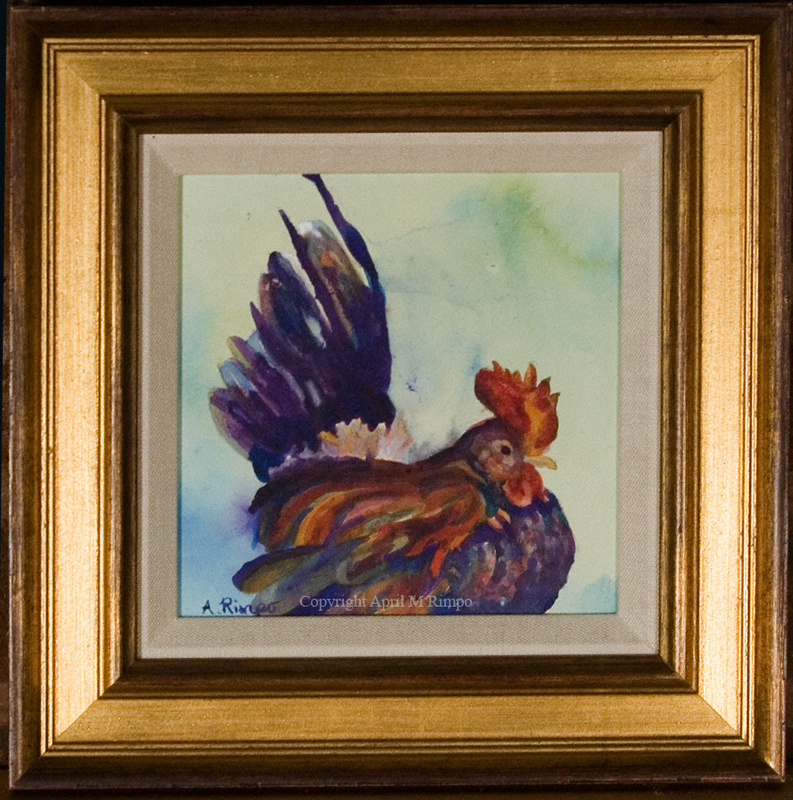 Oil painters have traditionally varnished their work for the same reason. 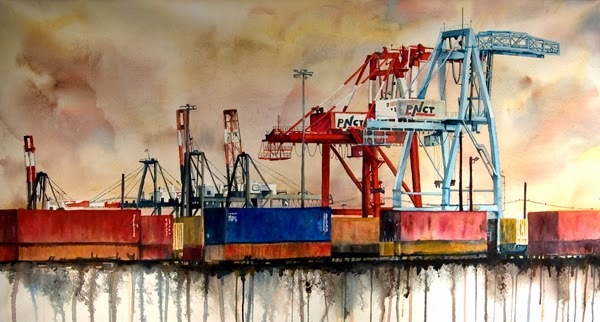 One of my larger gallery wrapped paintings, Freight Yard, 24" X 45"
I initially used only Liquitex Archival Permanent Varnish which I apply with a small 4" wide foam roller. 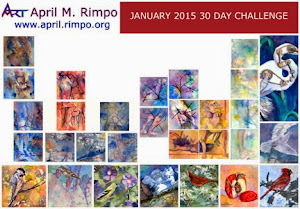 I found that the smaller gallery wrapped paintings remained very flat when I varnished them. However, some of the larger paintings ended up with ripples in the corners of the art. I experimented using different staples and staple guns when stretching the paper, but still sometimes ended up with ripples. I observed over time that when applying the first coat of varnish that I press fairly hard in the corners to get a solid coat of varnish. This process appears to stretch the paper and I believe the paper does not shrink back to its original size because of the varnish. As a result I started to use spray varnish for the first coat or two to avoid stretching. I have used a variety of spray varnishes including Golden Archival Spray Varnish and Krylon UV Archival Varnish. Spray varnish is a method to have a nice solid coat of varnish already on the entire surface of the paper before I use the roller to apply the later layers of varnish. This approach seems to eliminate ripples from forming (most of the time). Serendipity does sometimes prevail and I might get some ripples. Perhaps the level of humidity in the air is the culprit. If you are an artist, don't give up; you can re-stretch the piece, as long as you are careful, generally with good results. 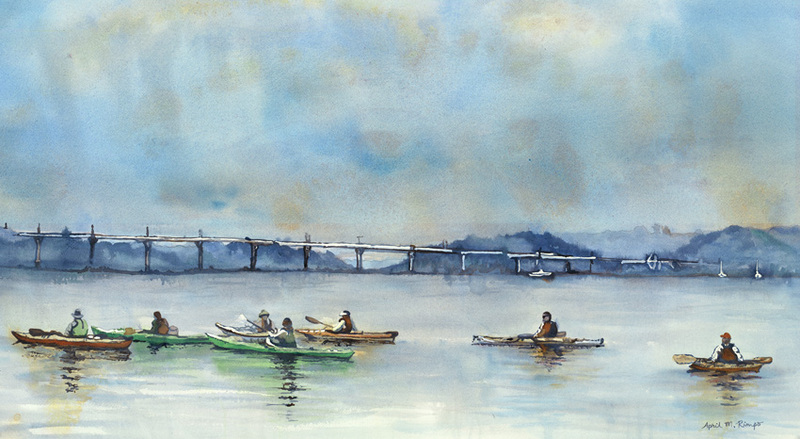 While out painting one afternoon I watched a pair of men unload kayaks from their vehicles and place them along the edge of the estuary. There were a dozen kayaks by the time they were done, then gradually more people began to arrive. They all dressed in life vests, got into the kayaks, and headed out for what appeared to be a lesson. 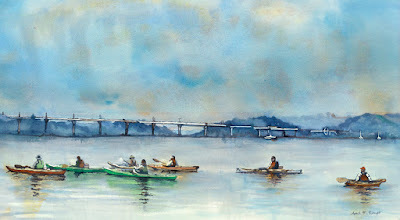 I don't know how long they stayed out on the water because they had not returned before I finished painting for the day. It was clear they were all having a great time. These kind of moments, when people are out enjoying their environment, always speak to me. After selecting sections from a variety of my photos from that day, I composed this painting, included some of the sailboats in the distance that were also on the water. Then I decided on a color scheme I felt would feature the kayaks while also making them at home in their surroundings. Using a lot of gray to emphasize the stillness of the water also helped communicate the distance between the kayaks and the bridge. This was an unexpected result, but one that might be helpful to me in future paintings. 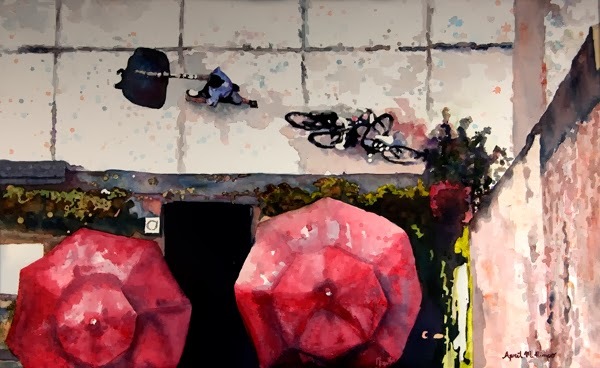 This painting is done in fluid acrylic on watercolor paper, then gallery wrapped around a 1.75" stretcher, and varnished to provide UV protection and to seal the paper from its surroundings. Because the paint wraps around the edge of the stretcher bars it can be hung without a frame, if desired. You won't really find this 1927 "I-5" Caboose on the rails since the Ellicott City Railroad Station no longer operates train rides, but you will find it on display on Maryland Avenue in Ellicott City, Maryland. That is one great thing about being an artist, you can jump back in time and sudden turn history into the present. 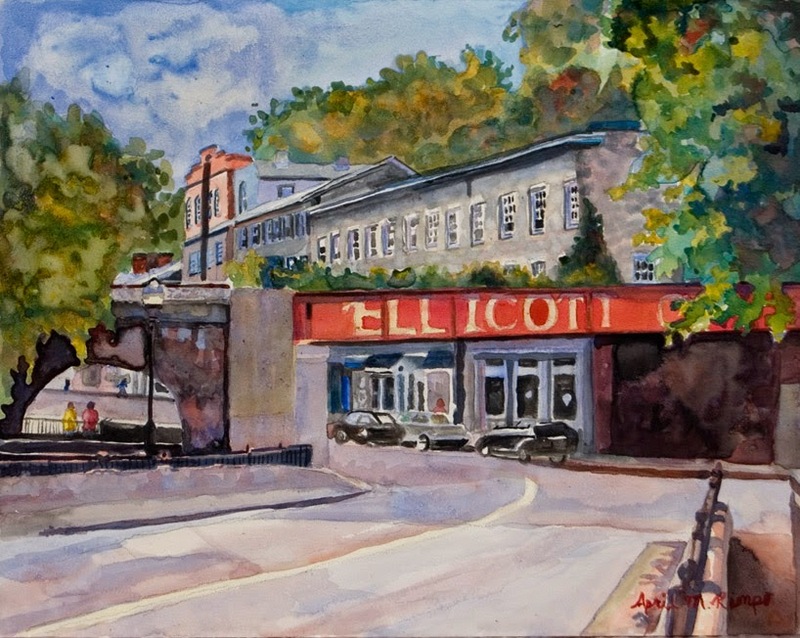 Entering through the Ellicott City sign on the B&O railroad track you find the former Patapsco Hotel, which was rebuilt in 1925. At one time the second floor of the hotel served as a passenger waiting room of the B&O Railroad. When I started to paint Rolling Hills I was planning to do a very different version of this scene, but sometimes the painting evolves in different directions. I planned an abstracted piece but it became very serene. Every time I look at this painting I want to be lying on the hillside by this lake watching the clouds drift by without a care in the world. It feels so peaceful to me. It was derived from a place on North Island, New Zealand but ended up more like the rolling hills in Matamata. Matamata is the site on South Island where Peter Jackson chose to build Hobbiton for the Lord of the Ring movies. 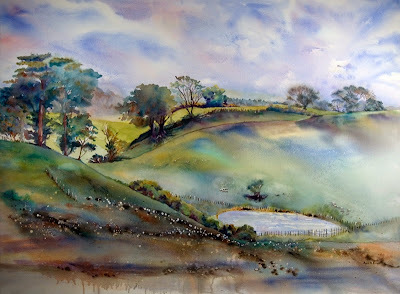 When my husband looked at the painting he asked if Hobbiton was over the rise. 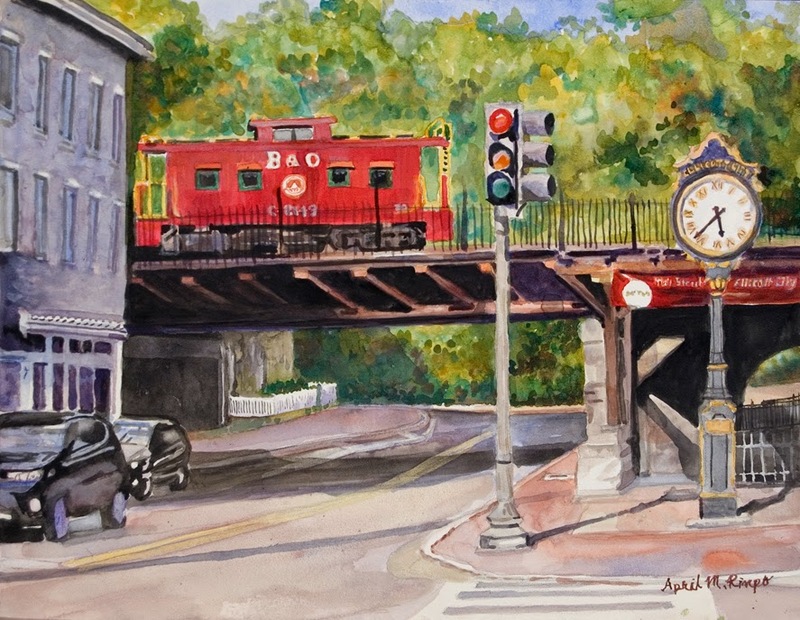 Similar scenes can be seen across rural America. Rolling Hills is the largest painting I have done to date. It measures 44" X 58" and is done in Fluid Acrylic on gallery wrapped and varnished paper. Framing is not required. In August my husband and I visited with my college roommate while strolling around the Montgomery County Fair. She had been helping in the beekeeper exhibit that morning, so we met up for a long overdue visit. One of the buildings held bunnies of every color and size and another contained rows and rows of roosters and hens. 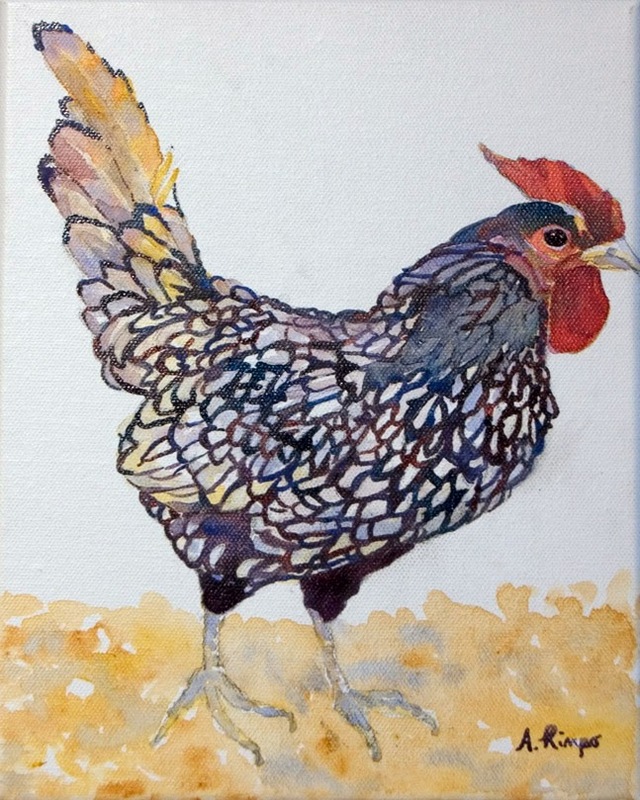 I snapped lots of photographs, especially of the roosters and hens. One of my neighbors has a chicken coop. We often hear the rooster crowing, but when I had asked her about photographing her rooster, she said I could but she didn't have a very pretty rooster and referred me to a neighbor. So along came the Montgomery County Fair and I had no lack of choices. Here are two that I decided to do as small acrylic paintings. 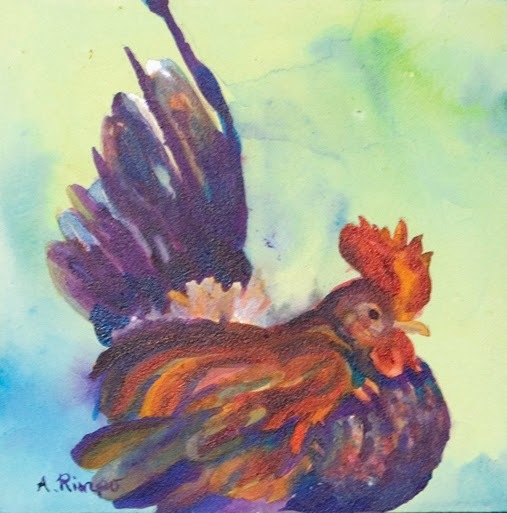 I took a lot of liberty with the color of the sitting rooster, but the standing rooster is pretty accurate. On first glance you think this rooster is black and white, but there were many pale hues in the white feathers, which I just had to capture. You know me and color. So enjoy these new little paintings. I hear a kitchen calling out there somewhere that is just in need of a new spark of color.